Looking for the classier model of the Pebble smartwatch? The Pebble Steel is now available from Best Buy, priced at $229. 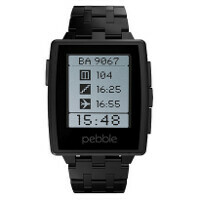 This saves you all that time waiting for the watch to arrive if you purchase it from the Pebble website. This is actually the first time that Pebble Steel will be offered in a retail store. Previously, the plastic variant of the wearable was offered on Best Buy's shelves, and Pebble Steel was available online only. Pebble Steel will be offered at Best Buy in Brushed Stainless or Black Matte, and the aforementioned price includes a $20 discount. The watch goes on sale at the tech retailer starting on June 15th. Both models come with a leather strap, although later this year a matching metal band will be offered as a separate accessory. It has been quite a ride for the gang at Pebble, starting with the amazing amount of crowd-sourced funding it received at Kickstarter. The watch had a leading 35% share of the smartwatch market in the first quarter of this year. I've had my Pebble since they first released the KickStarter units, and I can't live without it. My only complaint the whole time has been that as much as I love it, it's Fugly. This is great news though, because they definitely fixed that with Steel, but I didn't want to drop $300 after I already spent $150. ANyone wanna buy an old Pebble? ha! In not too long, Pebble watches will be like old Casio watches. Classic in their own way, but the modern version of the same thing will be available for $50 or less.